Of course, Trump was just a novice politician in 2016 and now he’s president, able to order up briefings on any subject he wishes. One would expect that he’s had more than one briefing on NATO, especially before his recent trip to NATO headquarters. But, alas, there appears to little increase in his understanding. NATO was established in the aftermath of World War II, originally with 12 members and the intention of binding together Western Europe in a defense alliance with the United States and Canada to counter the Soviet Union and its satellite countries in Eastern Europe (known as the Warsaw Pact). After the Soviet Union collapsed and the Warsaw Pact unraveled, NATO expanded to include many Eastern European nations and even former parts of the Soviet Union. There are now 28 member countries in NATO. There are two types of funding for NATO: direct funding and indirect funding. Direct funding, for military-related operations, maintenance and headquarters activity, is based on gross national income — the total domestic and foreign output claimed by residents of a country — and adjusted regularly. With the largest economy in NATO, the United States pays the largest share — about 22 percent. Germany is second, with about 15 percent. A significant portion of the U.S. share is operating the Airborne Early Warning and Control System (AWACS) fleet operations, according to the Congressional Research Service. The U.S. share of the actual military budget is negotiated each year, but largely based on the cost-sharing formula, and amounts to less than $500 million a year, according to Defense Department documents. That’s a rounding error in a $600 billion defense budget. But Trump is really talking about indirect funding. Since 2006, each NATO member has had a guideline of spending at least 2 percent of gross domestic product on defense spending. At a 2014 summit, responding to Russian aggression in Ukraine, NATO members pledged to meet that guideline by 2024. At the moment, only five of the 28 members exceed the guideline — with the United States leading the way at 3.6 percent. The other members that exceed the guideline are Greece, Estonia, Britain and Poland, but the perceived threat from Russia has prompted other nations to bolster their defense spending. In 2016, median spending by NATO members on defense was 1.21 percent of GDP, but it’s still eight years away from the deadline. The guideline is not legally binding. Moreover, as defense experts Richard Sokolsy and Gordon Adams have noted, the 2 percent guideline is rather arbitrary. Greece met it, even though it has slashed defense spending, because its economy collapsed. “Measuring what the allies spend on defense as a share of their economies tells us nothing about the capabilities they are buying,” they wrote for the War on the Rocks website. Yet Trump continues to misleadingly frame the failure to meet the guideline as money owed to the United States: “This is not fair to the people and taxpayers of the United States. And many of these nations owe massive amounts of money from past years and not paying in those past years,” he said at NATO, as cameras recorded puzzled or skeptical expressions on the faces of other leaders. Why does the United States spend so much more on its defense? The United States is a world power with global responsibilities, including in Asia. Iceland, which spends the smallest percent of its GDP on defense, does not even have a standing army, though it has a coast guard. The president is still regurgitating inaccurate campaign rhetoric. He appears to now understand that NATO members are supposed to meet a 2 percent guideline, but he still consistently frames this as money that is owed to the United States or American taxpayers. But even if all NATO members suddenly met the guideline, no additional money would end up in the U.S. Treasury. So the president is being deeply misleading. During the campaign, we originally gave Trump’s NATO comments Three Pinnochios, as more of the burden for defense of Europe falls on American shoulders. 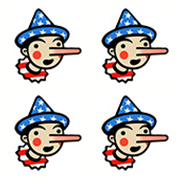 But enough time has passed, with so little change in the president’s rhetoric, that we are increasing the rating to Four Pinocchios.